Createspace Independent Publishing Platform, 9781466345034, 278pp. Did you and your parent ever keep a secret that lasted a lifetime? When Hanna Perlstein and her mother, Sidonia, come to Springfield, Massachusetts from a displaced persons camp after World War II, they know no one in America. With no other family, except each other, they build a world that revolves around Sidonia's extraordinary talent with a needle and thread to create beautiful garments while Hanna serves as her dutiful model. As Sidonia becomes well-known in western Massachusetts and northern Connecticut for her remarkable sewing talent, she continues to keep her inner secrets about her past hidden not only from her daughter but from everyone else. Determined to craft a life of pride, self-reliance and perseverance, Sidonia teaches her daughter to "stand up straight" in fashion and in life. Sidonia's Thread uses sewing metaphors to tell the tale of these two women as though stitched together like a handmade garment. Why did Sidonia keep these significant life secrets, and why was Hanna so afraid to ask about them? When Sidonia moves to elderly housing, Hanna steals some of her old letters and photographs hoping to find clues to her paternity, her mother's reclusive behavior, and her heritage. 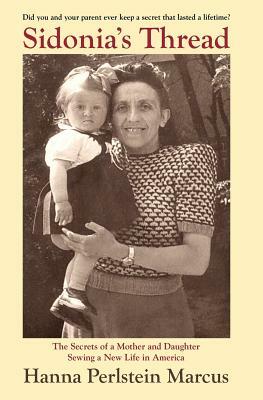 Combined with a trip to her mother's Hungarian homeland and a phone conversation with her father, Hanna's surprising discoveries inspire a revised view of her life with her mother, replacing her conflicting emotions toward her mother with true reverence. Hanna Perlstein Marcus, who was born in a displaced persons camp in Germany after World War II, is a licensed social worker who has worked for local governments in various neighborhoods in Connecticut for over thirty years. She holds degrees from the University of Massachusetts and the University of Connecticut. Ms. Marcus is the first prize winner in the 2011 short story competition of the Connecticut Authors and Publishers Association and has authored a number of articles in the human services field. Sidonia's Thread is her first full-length book. She has two children and two grandchildren and lives in Connecticut.